The usd to cad pair has now reached an interesting technical point on the daily chart which could well define whether we see a break higher following the recent short term rally or, alternatively, a collapse of the recent momentum as the move runs out of steam. The defining price level is of course that between 1.06 and 1.10 and should we see the current momentum continue with a breach of the upper level, then this should provide the necessary platform for a sustained and longer term rally higher in due course. However, yesterday’s price action was far from conclusive, ending the trading session with a narrow spread down candle, but one with a small lower shadow which seemed to suggest a modicum of bullish sentiment remaining in the market. 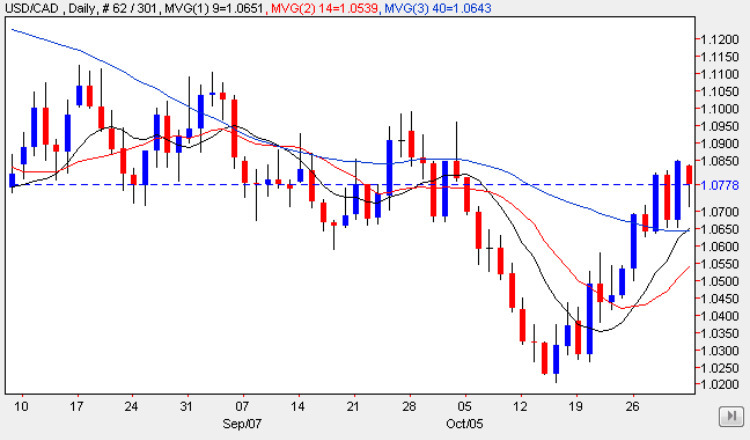 Indeed with the 9 day moving average now firmly crossing the 40 day average, this has added to the bullish picture, and coupled with a clearance above all three averages, this is adding to the positive feel for the usd to cad pair, with the lows of recent days all finding support from the 9 day average. The key will be the upper level of the deep congestion that has now been penetrated, and should the pair emerge to the top side in due course, then we can expect to see a sustained move higher in due course, probably helped with US dollar positive sentiment should the FED signal an interest rate rise sooner rather than later based on the recent ‘good news’ stories for the US economy. With the statement due for release tomorrow, and with NFP on Friday, this could define the technical picture for the usd to cad in the medium term as a result.